American Rhythms is a film about a group of students at an inner-city elementary school who experience drumming as a life-transforming tool. A community struggles to assimilate with the "American way" while holding fast to their cultural heritage enduring gang violence, poverty, and a lack of resources. Yet a rhythm of hope beats. Throughout our history, humans have used the moving sound and vibration of drumming. It has been a force of expression, communication, music, meditation and prayer. And, now it finds its way into an elementary school in Northridge, California. The heart of this community is discovering that its benefits bring more than just a musical experience to these young children. 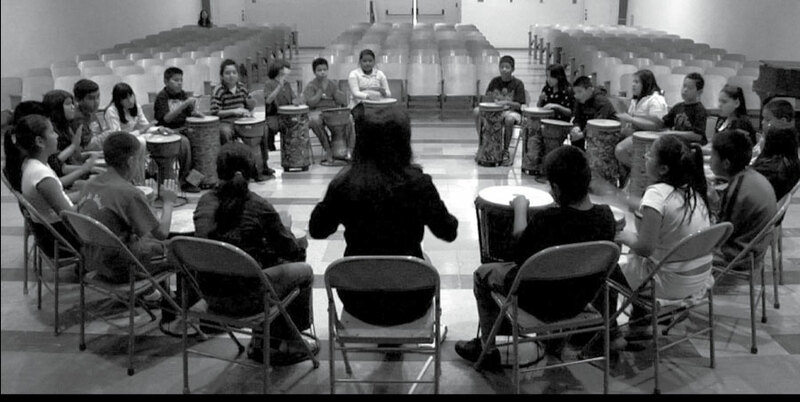 Drumming at Napa Street Elementary School has become a transformative activity that may just help its students change the trajectory of their own lives and the community they are growing up in. We follow Ms. Gilmore's 5th grade class. Most of them have been at Napa since they were kindergarteners. Now we find the little innocence these children have been afforded being eroded as they negotiate their lives and sense of future around more harsh environments. We watch to see how these 10year olds cope with their new position as the oldest kids on the playground all the while anticipating becoming the youngest at the intimidating thousand-student middle school. Exposed to the focused drumming sessions, we see the powerful effects that being part of the drumbeat have on our little friends. We see how teachers and counselors use the drum to help children learn more about themselves, their peers and move beyond the stressors they face. Beat the Odds is a program that integrates activities from contemporary drum circles and group counseling to teach skills such as focus and listening, team building, leadership, expressing feelings, managing anger/stress, empathy and gratitude. UCLA researchers have shown that Beat the Odds can significantly improve inattention, withdrawn/depressed behavior, posttraumatic stress, anxiety, attention deficit/hyperactivity, and oppositional defiance. Remo Drums is a quality drum manufacturing company. With specialized, unique and exceptionally crafted drums, they are unmatched in their quality. Remo is a proud sponsor of American Rhythms.